If you are among the nearly 200,000 Americans who transition each year from military service to civilian life, one of the toughest challenges can be finding a profession that utilizes the skills you have acquired during your active duty. The civilian workforce may seem alien at first, requiring different abilities and behaviors than those you employed in your military career. But military experience provides a wealth of advantages if you are seeking a job in the private sector, including—according to the United States Department of Veterans Affairs—a strong work ethic, a deeply instilled sense of discipline, and a thorough understanding of the importance of teamwork. The trick, though, is highlighting those assets to potential employers—especially during job interviews. The first step toward making the best impression in an interview is to do your homework beforehand. According to Hire Our Heroes, a veteran-founded nonprofit that offers veterans a host of free resources for finding new civilian careers (including resume building, job training, and mentoring), it is especially important for veterans to research the companies where they are interviewing. "Take the time to review the requirements of the jobs you are applying for," Dan Caporale, chairman and founder of Hire Our Heroes, says. "That way you can identify parallels between what your potential employers need and what your military service has equipped you to deliver." It can also be helpful for you to simply go on as many interviews as possible—just to get acclimatized to corporate culture. "I always tell people to take every interview, even if it is not for a job they think they want," says Caporale. "When they get used to the feel of that sort of work environment, it helps them to loosen up a little." While confidence, politeness, and punctuality are all key to acing an interview, he notes that exhibiting too much of the ceremonious, straitlaced mien that is ingrained in military culture could make a different impression than intended. Translating how your military skills have prepared you for civilian employment and the particular job you are applying for is the way veteran candidates can shine, according to guidelines from Hire Our Heroes. Explaining, for instance, how being deployed in various locations allowed you to adapt quickly to new environments, or how working with a squad or platoon on a critical project helped you foster cooperation, will help you stand out in an interview. But it is important to choose positive experiences to highlight. Try to avoid military lingo (like acronyms) in your descriptions, as your interviewer may not follow. "Asking specific questions about the role you are applying for can also go a long way to set you apart as an applicant," says Caporale. "It shows not only that you have done your research, but also that you are deeply interested in how your particular skills might meet your interviewers' needs." 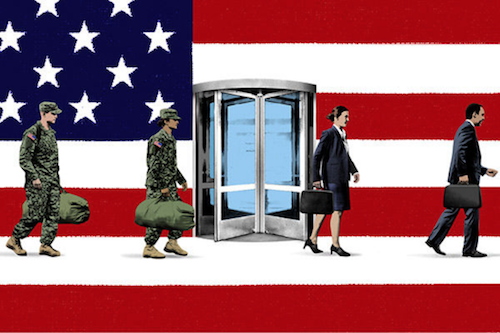 Above all, Caporale says, the most important thing for veterans to remember during interviews—and every other stage of the transition to civilian employment—is to feel proud and valuable for what they have to offer. "Veterans bring so much to the table with their skills, training, and determination," he says. "It is just a matter of showing it to employers. That is why the best advice I try to give is always, 'Be yourself.'" GEICO has been a proud supporter of military members and their families for over 75 years. To find out more about military discounts and benefits you could receive, go to geico.com/military or call 1-800-MILITARY. Interested in joining the GEICO military team? Head to geico.com/careers to learn more.